These five causes are the common ones I see with my clients. The trick is to accept responsibility for the them not doing what you want and be open to exploring these five causes. 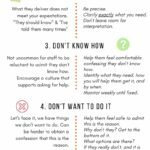 Check these 5 reasons when staff are not doing what they should.